Good Morning, this is Capital Essence’s Market Outlook (the technical analysis of financial markets) for Wednesday September 19, 2018. Stocks closed higher Tuesday as investors shrugged off a fresh exchange of tariffs between US and China. The Dow Jones Industrial Average rose 0.7 percent to 26,246.96. The S&P gained 0.5 percent to close at 2,904.31. The Nasdaq Composite advanced 0.8 percent to 7,956.11. The CBOE Volatility Index (VIX), widely considered the best gauge of fear in the market fell more than 6 percent to close at 12.79. Consumer Staples stocks were under selling pressure Tuesday amid ongoing concerns that escalating trade war could drag on earnings. After surging about 10 percent in 2017, the Consumer Staples Select Sector SPDR ETF (XLP) fell 0.42 percent Tuesday to 54.73, down nearly 4 percent YTD while the S&P gained more than 8 percent over the same period. Now the question is whether recent pullback is a pause that refreshes or it’s a beginning of a something worse? Below is an update look at a trade in XLP. Our “U.S. Market Trading Map” painted XLP bars in red (sell) – see area ‘A’ in the chart. 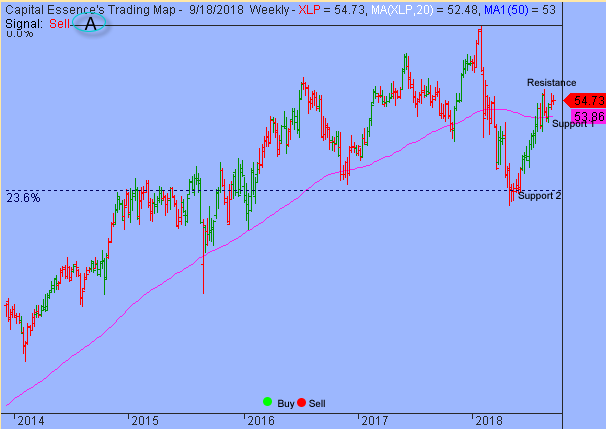 Over the past few weeks, XLP has been basing sideways near the 2-year moving average after the May recovery rally stalled near the February congestion zone. This is a bearish development, indicating a lack of commitment among the bulls. Over the next few weeks, traders should monitor trading behaviors as the 2-year moving average, near 54, is tested as support. That level was tested several times over the past years. A close below it on a weekly basis could trigger a new down leg with downside target around 49, based on the 23.6% Fibonacci retracement. XLP has resistance near 55.30. Short-term traders could use that level as the logical level to measure risk against. Short-term technical outlook shifted to bullish. Last changed September 18, 2018 from slightly bearish (see area ‘A’ in the chart). Once again, S&P climbed above the important sentiment 2900 mark after recent pullback found support at the lower boundary of the pink band. This is a positive development but let’s notice that the rally has created overbought conditions. Technically speaking, while overbought condition is normal during a pro-long uptrend, it’s suggested a cautious approach in the near-term. For now, 2900 is the line in the sand. This level was tested several times over the past weeks. This history indicated an important role in terms of support. A close below that level signify a significant trend shifts and a retest of the trend channel moving average, currently at 2840, should be expected. Short-term trading range: 2846 to 2924. S&P has support near 2900. A close below that level will trigger a short-term sell signal with downside target near 2849, based on the trend channel moving average. The index has resistance between 2916-2924, or the lower boundary of the red band. Long-term trading range: 2700 to 3000. S&P has support near 2800. A close below that level will trigger a major sell signal with a downside target near 2700. The index has resistance near 3000. 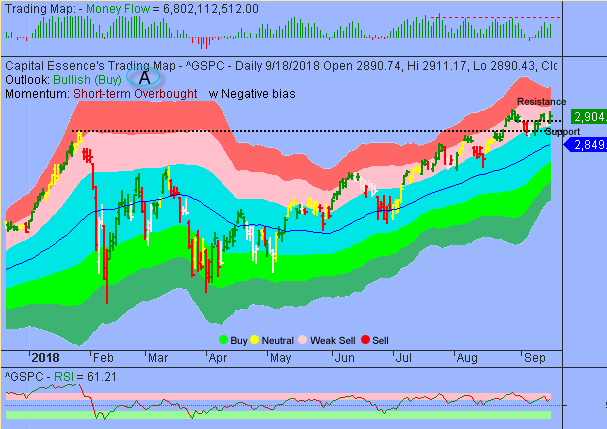 In summary, while the market could continue to drift higher as trading sentiment remains strong, given the looming resistance at the lower boundary of the red band, there is no reason to accumulate stocks aggressively at this point. As for strategy, traders should consider buying into market dips rather than chasing breakouts.